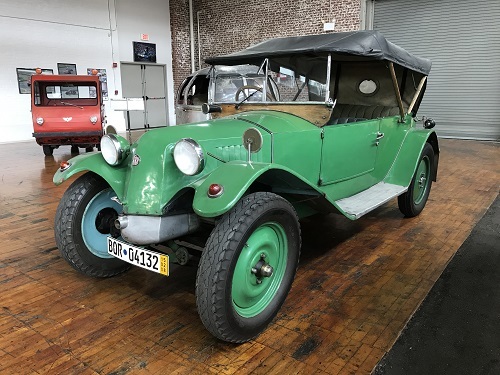 The Tatra T-11 was the first car made entirely by Tatra in 1923. The T-11 was famous for its robust and innovative designs which featured an air-cooled engine and swing axle rear suspension. The T-11 was designed by Hans Ledwinka who was one of the most original and logical designers to work in the motor industry. Mr. Ledwinka was working for Steyr, and wanted to design a “peoples’ car,” but the management of Steyr would not allow this project to begin because they did not believe that cars could be made for the masses. Believing otherwise, Ledwinka went to work for Tatra and created the T-11 as a peoples’ car. It was a roaring success and was followed by the T-12 (which was almost the same car). Mr. Ledwinka would remain the chief designer of Tatra cars until 1945.